I don't remember how or when I happened upon Lisa Isaac's blog, Handmade in Israel, but I do know I enjoy her posts. Even as a young child, Lisa was sure an art career was in her future as she has always been busy with her hands and making things. 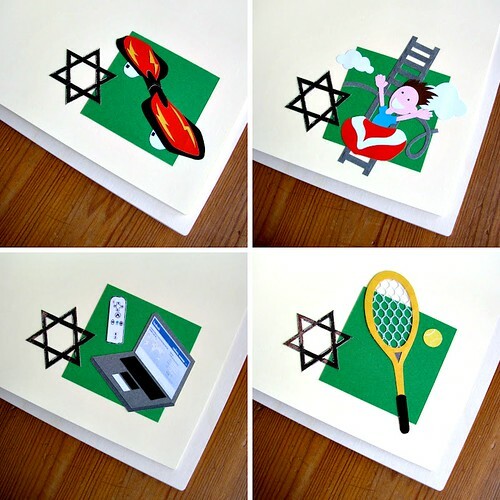 In addition to sharing her latest paper cutting projects on the blog, Lisa features events, holidays, local foods and flora, and trips taken with her family to interesting Israeli locations. She has a degree in Graphic Design from John Moores University in Liverpool and worked as a graphic designer and art director before her children came along, all the while making special cards to send to family and friends. Lisa approached a local store that immediately took on her cards, and has been cutting and sticking bits of paper ever since. 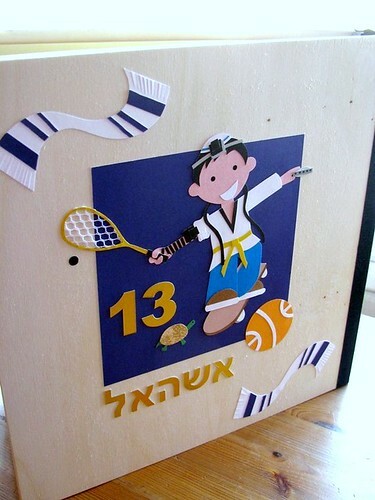 A special niche is personalized Bar Mitzvah and Bat Mitzvah albums. 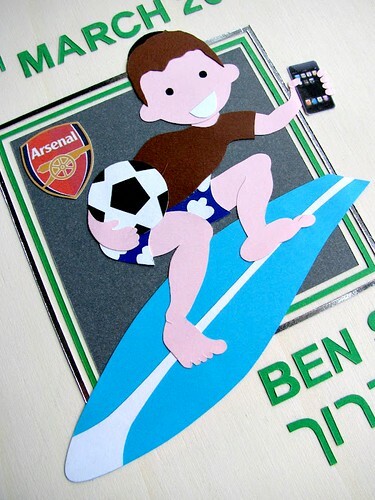 She goes to great lengths to incorporate the child's interests on the cover and pages. Because her work looks so precise, you might suspect Lisa relies heavily on a die cutting system, but this is not the case. "All my cutting is by hand, apart from the occasional use of flowers and stars for which I have punches. I use a scalpel - the same one I have had since college - and a large pair of scissors. People often expect me to have all kinds of fancy equipment on my desk, but it's really nothing more than that!" "I start my designs by making a rough sketch. I am by no means an illustrator, but am not bad at drawing. I've made my own templates for all kinds of things by now too, and use them as well. I have my trademark round head with the little sticky-out ears in many different sizes!" 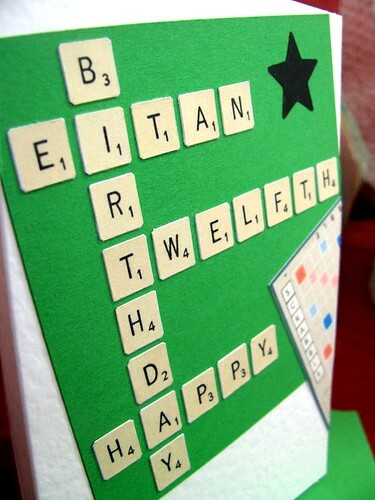 Lisa also creates cards, albums, and pictures for weddings or any special occasion... as examples, this card for a birthday boy who loves the game of Scrabble and a simply adorable dog that would be cute in a nursery. Visit the Handmade in Israel blog and shop. Ann, Lisa's fresh modern designs are inspiring. I enjoyed browsing her blog too...what one can do with paper! I've been a fan of Lisa's work for quite a while. So glad you featured her in this interesting post! I'm also a huge fan of Lisa's work! Her designs are adorable and the custom work she does is phenomenal and completely captures the personality of the person. Yay, Lisa! 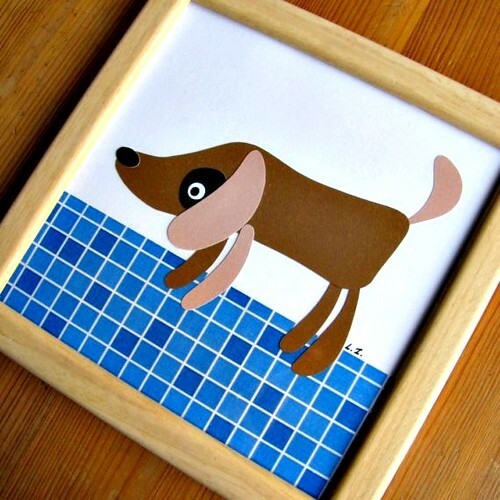 Lisa's work is amazingly cute! All done by hand too? She must have lots of patience! love Lisa's cards and papercut creations - great detail!! So very cute!! I like it so much for being so simple , She uses simple tools to cut makes her work more inspiring. Thank you so very much for this feature, Ann. I am thrilled by it.. and of course by all of these encouraging comments too! Love seeing Lisa's work here--it's always so fresh and happy! I love Lisa's work. It is fun and very customized! I can't even imagine how Lisa cuts those shapes by hand so perfectly! Her cards always look so cheerful and I'm sure the recipients must treasure them.